ES Audio Industrial Co., Ltd. Manufacturer of Electronic, Electrical Products & Accessory. 1. Raising one sound of loudspeakers of neon lamp glimmers, as rhythm glimmers, very beautiful. 2. The high pitch is fine and smooth, middle pitch is energetic, bass is abundant, sing or listen to the song, one hits highest grade. 3. 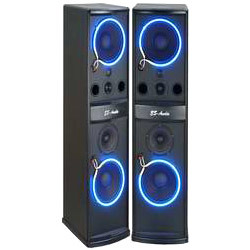 The loudspeaker is best in quality, let the sound upgrade, the music is thick. 4. The audio amplifier design makes a reservation accurately, the voice is ultra and clear naturally. 5. Bear frequency high, the sound way is designed 4 sound ways of 6.5 inches, the sensitivity is extremely high. 1. Frequency response: 50 Hz－20 KHz. 2. Drive the power: 150 W MAX. 3. The sound way designing: 10" 5 way. 4. Sensitivity: 92 db. 5. Audio input/output impedance: 6 Ω. 6. Dimension (L x W x H): L 43 x W 34.5 x H 127 cm. 7. Weight (each): 28 kg/one. 8. Loudspeaker: high pitch 1"x2、middle pitch 6.5"x1、bass 10"x2. 9. Avoid the sound of the power and accuse of the neon and design the light.